In a system of 4-splits on a set X with |X| >= 4 , for each 4-element subset a, b, c, d of X , all seven possible 4-splits a|bcd, b|acd, c|abd, d|abc, ab|cd, ac|bd and ad|bc are assigned a non-negative weight. 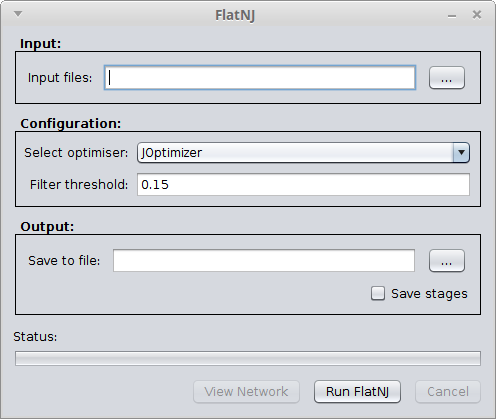 FlatNJ then, from a given system of 4-splits, generates a split network that is guaranteed to be (almost) planar. FlatNJ is based on an agglomerative approach similar to the one used in methods such as NeighborJoining (Saitou and Nei, 1987) and NeighborNet (Bryant and Moulton, 2004). The run time for generating the unweighted split system underlying the final result is O(n^4). Suitable weights for the splits are estimated using a least squares fitting between the given system of 4-splits and the system of 4-splits induced by the resulting weighted split system. To solve the least squares problem the SPECTRE metaopt system is used to hook into external solvers, although we recommend that Gurobi Optimizer (www.gurobi.com) is used as the external solver if available. The resulting weighted splits are filtered using the approach described in (Grunewald et al. 2007) and, using the method described in (Spillner et al. 2011), an almost planar split network is constructed. In order to view the drawing of the network the split network viewer included in SPECTRE can be used or, alternatively, external software such as SplitsTree (Huson and Bryant, 2006). When running FlatNJ for large datasets, it is recommended to allocate more RAM for the heap space. Otherwise an OutOfMemoryError may occur. Heap space can be increased using the Java VM options -Xms or -Xmx. See Running SPECTRE Tools for more information on how to adjust these options with SPECTRE scripts. The input to FlatNJ must be provided using the positional argument <input> and the output is written to the file indicated by the -o/--out <nexus file> command line parameter. Split with relatively small weight that are incompatible with much bigger splits in the output are filtered out from the network using the approach described in (Grunewald et al. 2007). The filtering threshold is a number between 0 and 1. The default filtering threshold is 0.15. It can be altered using the -t/--threshold <[0.0,1.0]> parameter; choosing 0.0 as the threshold results in an unfiltered network whereas 1.0 yields a network that is a tree. Alternatively, FlatNJ can be invoked through the Tools menu of the SPECTRE viewer. The following walk through examples illustrate the usage of FlatNJ for molecular sequence data and for geographical data. Note that the drawing of the network can be adjusted by the user in SplitsTree. Open a terminal window and change to the directory of FlatNJ. To view the network launch the SPECTRE viewer and open <output_dir>/colors.nex. The network displayed by the viewer should look similar to the one in Figure 1. Figure 1: Split network generated from the multiple protein sequence alignment from <spectre_dir>/examples/flatnj/colors_aln.faa. Open a terminal window and change to an empty working directory. To view the network launch the SPECTRE viewer and open <output_dir>/europe_net.nex. The network displayed by the viewer should look similar to the one in Figure 2. Figure 2: Split network generated from geographical coordinate data in <spectre_dir>/examples/flatnj/europe.nex. The network was rotated and flipped to align it with the usual representation on a map. For input and output files the nexus format is used, with the exception of multiple sequence alignments that may also be provided as a fasta file. The various types of blocks in a nexus file used by this software package are listed in Table 1. The syntax of blocks specific to this software package is defined below. The syntax of commonly used blocks can be found e.g. in the SplitsTree manual (http://www.splitstree.org/). Multiple sequence alignments may be provided in either fasta or nexus files. In case the nexus format is used, sequences must be placed within the CHARACTERS or DATA blocks. Character distance matrices that are used by FlatNJ for the estimation of 4-split weights from multiple sequence alignments must be placed in the DISTANCES block. All weights must be written in the same line. M.Balvociute, A.Spillner and V.Moulton. FlatNJ: A novel network-based approach to visualize evolutionary and biogeographical relationships. Systematic Biology, 63(3):383–396, 2014. D.Bryant and V.Moulton. Neighbor-net: an agglomerative method for the construction of phylogenetic networks. Mol. Biol. Evol., 21:255–265, 2004. S.Grunewald, K.Forslund, A.Dress and V.Moulton. Qnet: An agglomerative method for the construction of phylogenetic networks from weighted quartets. Mol. Biol. Evol., 24(2):532–538, 2007. D.H.Huson and D.Bryant. Application of phylogenetic networks in evolutionary studies. Mol. Biol. Evol., 23(2):254–267, 2006. N.Saitou and M.Nei. 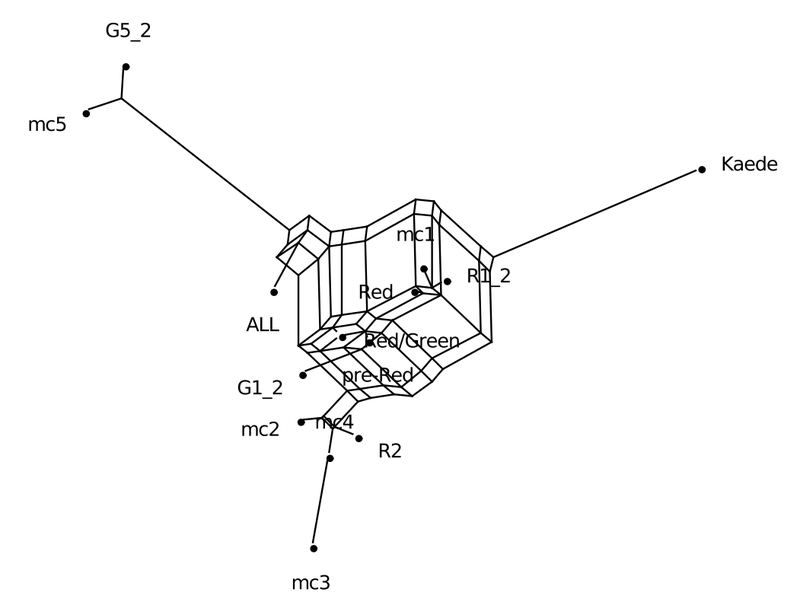 The neighbor-joining method: a new method for reconstructing phylogenetic trees. Mol. Biol. Evol., 4:406–425, 1987. A.Spillner, B.Nguyen, and V.Moulton. Constructing and drawing regular planar split networks. IEEE/ACM Trans. Comput. Biol. Bioinform., 9:395–407, 2011.